Figure 6 from page 20 of the report: Tin roof households in the villages. Such building materials can contribute to exposure to heat stress. Source: WOTR. Increasing temperatures are likely to impact human health. An increase in severe heat wave days and heat mortalities has been observed in India over the past few decades. A report by National Disaster Management Authority states that about 22,562 heat related deaths were reported between the periods 1992 to 2015. A body of literature is available on heat stress in urban areas and for few occupational settings. However, there is little evidence on the heat experience, impact of heat exposure, and adaptation measures to heat stress in the rural context. In this context, the study examines vulnerability of rural communities to heat stress in the semi- arid villages in Maharashtra state in India. A summary of key sections of the report are provided below. Please see the full text (download from right-hand column) for much more detail. The study was conducted in Jalna district, located in the central part of Maharashtra state. Three villages were selected from Jafrabad and Bhokardan blocks in the district. 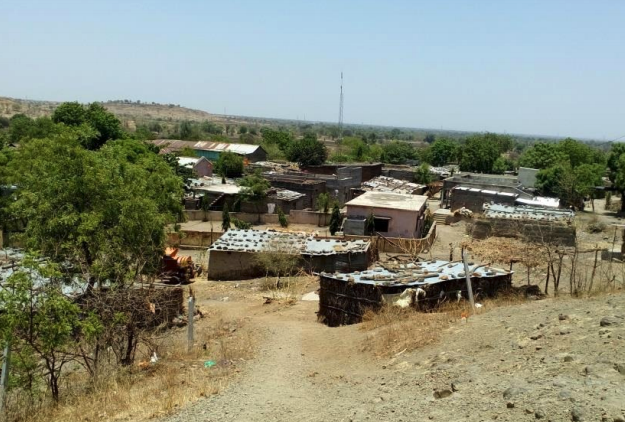 The blocks of Jafrabad and Bhokardan in Jalna district were selected as there was anecdotal evidence of few deaths due to heat stress in 2014. The factors considered for selecting the villages were: sparse vegetative cover, lack of access to water and remoteness. From each of the three villages, a sample of 20% total households accounting for 215 households was selected for detailed household survey. The sample households comprised of 1224 individuals of varied gender, age, wealth, litteracy, employment and caste. Individual interviews were conducted in the month of May 2016, which is the peak summer period in Maharashtra. An adult household member was selected as the respondent who provided information regarding all other members of the family. The occurrence of each Heat Related Symptom (HRS) in the individual was recorded. The types of Heat Related Symptoms (HRS) considered included: small blisters or pimples, dry mouth, fatigue, leg cramps, heavy sweating, intense thirst, rapid heartbeat, headache, leg swelling, paranoid feeling, swelling of face, fever, diarrhoea, hallucinations, vomiting and fainting. Hallucinations and fainting were considered as severe HRS whereas the rest were considered as mild HRS for analysis. The impacts of hot weather were found to range from discomfort to illness. The types of health concerns included headache, fever, vomiting, weakness, ‘paranoid’ feeling (as expressed by people), restlessness, dizziness and fainting. Among the heat related symptoms experienced by the household members, headaches, heavy sweating, fatigue, intense thirst, dry mouth and small blisters/ rash were found to be the most commonly reported symptoms (Figure 2, below). Of all household members, 46.2% experienced at least one HRS during the study period. On average, at least two individuals were affected per household. Individuals from 64.5% households experienced fever and 21.5% households experienced diarrhoea during the study period. Figure 2: from page 14 of the report Heat Related Symptoms reported by the sample individuals. there was not much difference in the individuals reporting HRS among the two social Forward Caste and Scheduled Caste categories. One of the amplifying factors affecting exposure was the type of occupation an individual is engaged in. Those engaged in wage labour or labour intensive government employment scheme-MGNREGS works were more affected as compared to those engaged in non-income generating activities such as household chores and education. Apart from the livelihood activities, other household activities could also result in exposure to heat. Over 96% households collect firewood from field and forest. In over 93% households, the women were primarily responsible for fetching water. But during summer, men also support women in fetching water. Another amplifying factor of exposure is the type of shelter or dwellings. A large proportion of households (about 74% of sample households) were living in tin-roofed houses. Tin roofs get heated quickly during daytime as compared to cement slab roofs but they also cool up rapidly as compared to the cement roofs. about 25.6% households reported no specific measures being used. Figure 8 from page 22 of the report: Coping strategies employed by respondents during very hot weather (n= 215). Increased water consumption and shade seeking are key adaptive measures used in the villages. However, almost 89% and 79% respondents reported that the water bodies and tree cover in their respective villages were poor or very poor. A significant proportion of households (44%) approached private doctors in the case of heat related symptoms. However, poor transport facilities (65.7%), followed by distance to health centre (41.4%) and cost of utilizing healthcare (31.4%) reduce the likelyhood of individuals using healthcare facilities. About 53% of total sampled households reported having received information on heat stress from at least one reliable source like TV, radio, newspaper or a medical professional, and the majority of respondents (72% of sample households) felt it was important to have access to weather information. However, about 23% households only received information through word of mouth. In recent years, heat action plans have been prepared at state level (e.g. Uttar Pradesh, Andhra Pradesh, Orissa and Telengana), city level (e.g. Ahmedabad, Nagpur) and district level (e.g. Hazaribaug in Jharkhand state). However, their effectiveness on the ground needs to be assessed. Existing coping strategies appear to be inadequate to protect people from heat related stresses. It is important to make changes to work schedules, improve awareness of the communities to heat stress and take adequate precautionary measures. A major challenge in rural areas in the context of heat stress is accessibility to well-equipped health centres. A more long term strategy in terms of knowledge about heat stress symptoms and infrastructure and access to timely medical facilities is needed. For this, investments in upgrading of rural health infrastructure to handle heat stress related incidences should be considered. Further studies are also needed to monitor the indoor temperature of various housing structures (including roofing, ventilation, and location of windows, walls and floor) and the effect on individuals. In future, population exposed to heat waves is projected to increase. Hence, there is a need for preemptive strategies to ensure that people in areas where heat waves are not yet a phenomenon, are adequately supported to reduce their vulnerability. Improving health systems will benefit not just in the context of heat related illnesses, but for all illnesses, and so it is a no-regret intervention. Pradyumna, A., Bendapudi, R., Zade, D. and D’Souza, M. 2018. Heat Stress – Vulnerability, health impacts, and coping strategies in rural communities in the semi-arid region of Maharashtra, India. CARIAA-ASSAR Working Paper. International Development Research Centre, Ottawa, Canada and UK Aid, London, United Kingdom. Available online at: www.assar.uct.ac.za. WOTR is a not-for-profit NGO founded in 1993 operating currently in five 5 Indian states – Maharashtra, Andhra Pradesh, Madhya Pradesh, Rajasthan and Jharkhand.